SapphireOne inventory provides a powerful solution to inventory distribution control and tracking. SapphireOne’s excellence with the complexity of inventory control provides the necessary tools to assist with bins, matrix tables, batch control, serial number tracking, location control, department control and normal or non-diminishing stock. SapphireOne includes a choice of multiple costing methods: average, standard or fixed and item costing, using batch and serial items. Pricing updates can be easily imported via the SapphireOne gateway function. SapphireOne inventory module’s Pricebook enables unique pricing by client, client class, vendor, vendor class, inventory and inventory class, with extensive rule types, including quantity, rate and discount. Contract table provides a “can sell to” and “cannot sell to” list for clients and a “can buy from” and “cannot buy from” list for vendors, ensuring that your contract can be managed with ease. Quotes, requisitions, purchase orders, invoices, picking slips, packing slips, delivery dockets and many other designs can be customised and printed as required. View a quick snapshot of your margins or mark-ups with SapphireOne Sales Analysis. The Stocktake Entry screen allows control of the stock and automatic entry of the opposing adjustments within the General Ledger. The General Ledger account is the Debit or Credit side to be adjusted against the Inventory Asset Account. If the Stocktake entry involves negative stock, there is no cost change. When Stocktake adjustments are done, they must be posted immediately. These entries are based on a current snapshot of the current stock levels at the time of entry. Any Inventory stock that has its Type set as Hire is treated differently to all other stock. It is not displayed in any Sales or Purchase lists so that the user is unable to directly Purchase Hire items directly into Stock. This also means that accidental Selling or Purchasing of these items is also eliminated. This Function allows the transfer of stock between two product codes, for example, a special stocktake adjustment. When a large number of stock transfers are to be entered From and To the same locations it both simplifies and makes the data entry much quicker for the user. You only have to enter in the Location ID in the entry fields. SapphireOne will enter the Location Names as set up in the system. If we enter in the exact ID that we want for location A the system will ask if it is to create this new ID. If the user answers Yes, the system will clone the ID and place the quantity of stock into it. This Build Entry screen is used to enter the quantity of a Built Inventory item that has been built using a Base Inventory Inquiry. The various inventory items that go to make up this Built Inventory item are assembled by going to the Builds Lines Page and adding them as required. The inventory items selected to make up the Master Build item are listed under Item Lines area. If these items are sold consistently, SapphireOne will only require the quantity to be built to be entered. A limiting factor in the quantity will be the stock levels available at the time of entering this Build Entry. SapphireOne also allows you to create a one-off inventory item provided that the line items already exist within SapphireOne. The SapphireOne Inventory Management Function provides you with the ability to control various facets of your business such as Auto Billing, Standing Invoices, Parent Projects and Importer Functions. The Manager unit has five functions that allow the consolidation or automation of transactions from other areas of SapphireOne. The inquiries are: Manifest, Manager, Tariff, Manifest Vehicle and a Services Inquiries. This Inquiry Window displays the line items entered in the Invoice Screens. It lists all Stock Lines and allows full detailed reporting on all adjustments. By selecting Print on the main toolbar from the Inquiry Window you will be able to access your Purchasing Reports as discussed under the Purchases Menu. This is the same print screen as in the Transaction Line Inquiry screen in the Purchases Menu. Purchase Lines: This report summarises the Purchases into a single line. Allocation Analysis: This report details the invoices and payments including allocation from the individual vendor accounts. The Inventory Inquiry list screen displays a list showing the basic details of your Inventory items allowing for easy selection of any of your individual Inventory records for additional viewing and modification. It is commonly referred to as a Base Inventory Inquiry. An Inventory Inquiry is now much like the Client and Vendor master files. This is commonly referred to as Base Inventory and must be used when creating new inventory items. This will also create an additional Inventory Location item in the default Location as set in master defaults with zero stock. Any changes to the Base Inventroy Item will affect all locations, in particular, Pricing and Stock Levels. In other words on a global level. You will note that in the Details screen the area headings of Prices and Stock Levels contains this addition (Affects All Locations). When you have the Inventory Inquiry list on-screen, you will note that there are no location suffixes attached to the Inventory item ID. (The Location suffix is the tilda ~ ). For example, ASSIL BRAHAN BRAHIN CONARC to list a few from the Bondi Blue Demo. You can then use an Inventory Locations Inquiry to set individual prices on a location by location basis if required. Also, stock levels in Bins and also Bays are set in a Locations Inquiry as well. Also in the case of Building an Inventory Item, you must use an Inventory Inquiry to create the build. This screen is used to Process Transactions to the General Ledger in SapphireOne. The sole processing function is called Post Transactions. It is good practice to maintain regular posting as this is the point where stock levels are updated and details flow through to Accounts, although once posed a transaction may not be altered or deleted. This brings up the Standard Posting Screen for the selection of transactions entered through the Inventory Menu awaiting posting. If there is a WF error, transactions will not be permitted to post. More details can be found in SapphireOne manual guide. Adjust stock levels and costs with ease. SapphireOne stocktake entry enables multiple lines to be entered on each transaction and provides for specific tracking details such as dated, memo and reference numbers. The Transfer Entry screen is flexible in that it can be used to transfer stock to other stores or to other codes. That is, the user is able to transfer stock between two product codes, often this can be for a special stocktake adjustment, stock used as display and stock not for sale. 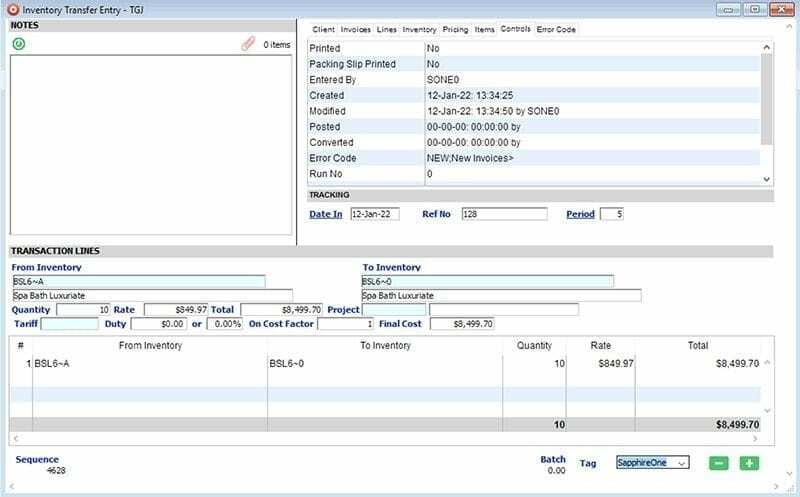 Assembling inventory items with ease – this is the transaction screen that is used to assemble an inventory item comprising of various stock items ready for sale. 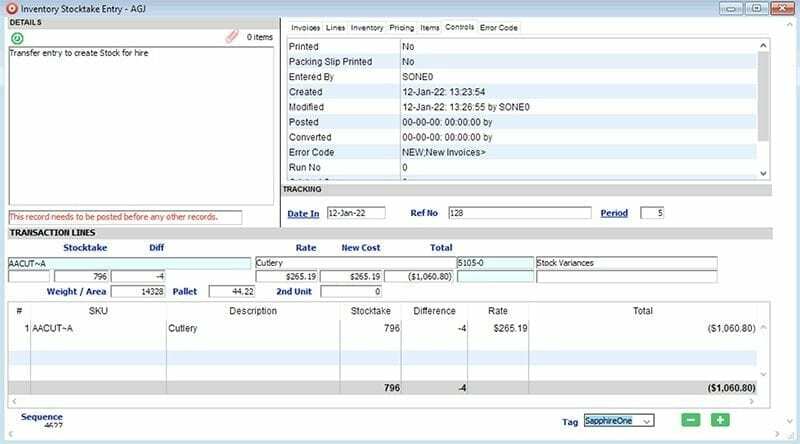 This inquiry window displays the line items entered in the invoice screens. It lists all stock lines and allows full detailed reporting on all adjustments. Inventory inquiry presents a window which contains the base details about an inventory item, allowing easy selection of the correct inventory items for viewing. Inventory displays the standard sales prices and the foreign currency prices for the inventory items. For the stock cost prices, the users need only select the next screen. This enables a bill of materials to be compiled and shows the items which are included in the finished item. This is often used for the creation of another inventory for sale. This screen is a summary of the items in the price book. Upon selection of a price book, the screen allows you to see the prices of items linked to this inventory item. Prices can be set for individual suppliers or customers, for inventory items, or for classes of inventory items. The flexibility of price book allows the user to set up the pricing to suit any sale offer they may be arranging. The details screen displays information about the inventory item, such as the ID, name, class, description of the inventory item, price, foreign exchange prices and stock levels. Obsolete inventory items can be made inactive, which ensures that they do not appear on standard searches; however, they can still be viewed if specifically selected. The inquiry screen lists all current transactions in numbered sequence. A current transaction is generally classed as a transaction which is dated in the current month, is in the current period, is unposted, has not been 100% allocated, has not been reconciled. SapphireOne also allows advanced search, sort and utility functions to be used in conjunction with the inquiry screens. However, we understand that occasionally the user may require transaction information which was recorded some time ago. In this case, the user need only to do a history transaction inquiry through utilities, transaction inquiry. This screen provides a summary of the inventory items with serial numbers that have been entered. The class inquiry enables the grouping of the inventory items into standard areas, allowing the production of reports from the Inventory file to be sorted into different orders. The number of classes available is unlimited and can be as general or as specific as required. This lists the build details that make up an item. That is, it lists all the inventory parts that make up a single inventory item. The SapphireOne Manager Menu enables simple grouping of common tasks for easy control of operations within SapphireOne. The objective of Manager is to act as an overall administrator on a range of automated functions to be executed on the data contained in SapphireOne. These include parent project, standing invoices, auto billing and importer. Tax calculation (BAS for Australia), is processed and reviewed in this area. SapphireOne has complete BAS and EBAS capabilities and stores a complete record of all historical BAS documentation, including calculation sheets and audit reports.